The 2010 Real Berlin Marathon produced a great men’s race, and a dominant women’s performance to kick off the fall marathon season. Nevertheless, it produced an enthralling race, which settled at about 15km, when it became clear that the world record was not going to fall. The race opened up at 30km, and it was Ethiopia’s Bizu Worku who did much of the early work. He was rewarded for his efforts with a third placed finish and a PB, and at just 20, he’s a name to look out for in the future. However, today it was the two established names of Makau and Mutai. Makau made the big decisive move at 40km, pushing through a 2:51 kilometer to shake Worku’s resistance. Then it was down to two, and in the end, with 200m to go, Makau had enough to see off Mutai. There was no Martin Lel-like kick for the line, just a high sustained pace which Mutai was unable to follow. Makau then, has run and won two major marathons, both in around 2:05, and he is now right up there as one of the great marathon racers. As is typical, a lot of talk after the race about what might have been in better conditions. It’s a pity there is such a pre-occupation about time, though given Berlin’s history, that’s to be expected. It was great to see a race in Berlin this year. The race splits are below. On the women’s side, it was Aberu Kebede who dominated the race. After a very slow opening 5km (18:03), she threw down the gauntlet with a suicidal 3:08 kilometer (I must admit some skepticism about the accuracy of that time). Only Bekele and Getaneh were able to to follow the pace, which soon settled at around 3:25 per kilometer. That pace eventually saw Bekele and Getaneh dropped, and Kebede ran most of the final 15km all by herself. Having been locked together with her country-women at 25km, her lead grew enormously from that point. At 30km, her lead was 32 seconds. At 35km, it was 1:03. 40km, she had 1:13, and that increase in the lead was testament to her dominance on the day. And it wasn’t as though she shifted into a higher speed – she kept producing 16:40-something 5km, the others dropped below 17 minute/5km pace. Her winning time of 2:23:58 is a PB, just outside the best in the world this year, but given the slow first 5km, and the conditions, it’s a great performance. Bezunesh Bekele held on for second, while Ganet Getaneh fell backwards progressively and dropped out before 40km. Third was eventually taken by Tomo Morimoto, just ahead of local favourite Sabrina Mockenhaupt, giving the locals something to cheer at the end. Next up in the marathon season, Chicago, which should be a terrific (and fast) race! But, before that, don’t forget the 5th Avenue Mile later today. The elite race starts at 12h50 ET, or 6h50 if you’re in South Africa (CAT). And we’ll have a live feed of that race here on the site, so check in later and be sure to catch what should be a great spectacle from the streets of New York! Thanks for joining our Berlin coverage! For those interested, below are comments from the race, as I watched live. Welcome to the live splits from the Berlin Marathon. The race is underway in a misty, wet Berlin, and the next two hours should throw up some fascinating racing, with the possibility of a world record for the men. 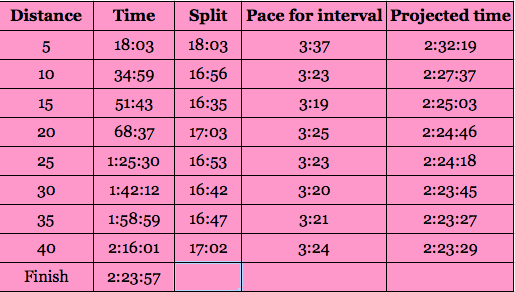 We’ll bring you the 5km splits, projected times and updated reports as it unfolds, so join us for an evolving story/post! After a “conservative” first 5km, the pace shifted up substantially from 5km to 10km, and by 10km the projected time was below Gebrselassie’s world record. However, the pace has been erratic – 2:54 followed by 3:05, followed by 2:55 again, and that may be attributable to the conditions with very wet roads. It may also be down to mistakes on the course measurements – the 19th kilometer was reported to be a 2:34/km, which is almost inconceivable. Hopefully the 5km times are accurate! The pace for the 13th and 14th kilometers has slowed significantly – both were outside 3:05. That may be the weather – the course is very wet and perhaps the puddles are affecting the pace. In any event, the record pace has drifted below the current tempo, and another shift would be required to bring it back. At halfway, the split is 62:36, which is quite considerably outside world record pace, and the requested pace for today (which was 62 minutes), and perhaps it’s time to call of expectations of a world record and focus rather on the race. There are currently eight elite men in the lead group, surrounded still by about four pace-makers. All the big names are still there – Makau, Kiptanui, Mutai. At 25km, the pace has now seemingly settled at around 3:00/km, which means a good race is on the cards from about 30km, when the last of the pacemakers should step aside. The elite group is down to seven – Bernard Kipyego is now 8 seconds down from the leaders. It’s building towards a fascinating battle over the final 10km. At 30km, the race has finally taken its shape – Bazu Worku of Ethiopia led at 30km, after a very quick last 5km – 14:42, 2:56/km. That pace shook all but three other men – a pacemaker, and then Geoffrey Mutai and Patrick Makau, the big favourites from Kenya, who are in familiar territory after their race in Rotterdam earlier this year. The rest of the elite field are almost 20 seconds behind, and include Eliud Kiptanui. Unfortunately, the weather has affected more than just the pace, it’s also preventing us from getting continued footage of the elites, and we’re watching a lot of 3-hour runners at the moment. So those of you who are struggling to get the internet footage, don’t worry – you’re not missing too much. I’m watching the feed and the splits are still the most informative source of information, which doesn’t say much! 38km, and the Kenyans have gone to the front. Makau moved past Worku and threw in a small surge, but it hasn’t done any damage at all to Worku, and still the three are locked together. It wasn’t an aggressive move, more just a change in leadership. With just over ten minutes to run, something must surely give within the next five minutes. The pace isn’t too quick – 3:01 for the 38th kilometer, so it’s become a little cagey. 39km – and Worku is once again pushing on at the front. The pace hasn’t increased – another 3:01 for the 39th kilometer, so it’s more attritional than explosive. Very aggressive running by Mutai at the front now, he’s pressing very hard with 400m to run. Under the Brandenburg gate and locked together – a great race in Berlin. Makau hits the front now and is this the winning kick? They’re still looking at each other…no Lel-like kick from these two! 200m to go, and now Makau sprints, and Mutai will NOT respond! It’s going to be Rotterdam again, Makau wins by 2 seconds and Mutai is second, just as in Holland earlier this year! Great race! The winning time 2:05:08, a great time in the conditions, with a superb finish! The women’s race only got going at 5km, after a very slow first 5km. Then the pace exploded – a 3:08 kilometer, which is suicidal in the marathon, followed by a series of 3:30 kilometers. The pace is now projecting a mid 2:20, which will be good going in the conditions. Three Ethiopians are in the lead – Kebede (who set the pace for that super-fast surge), Getaneh and pre-race favourite Bezunesh Bekele. The pace has held for the third interval, and is now projecting a 2:25. 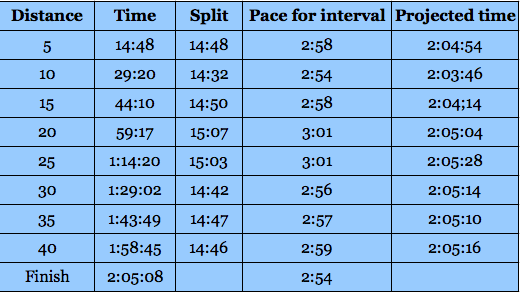 That projection is based on some very up and down pacing, with that very slow first 5km. More likely, we’re looking at a time in the range of 2:23. At 20km, the time is 68:37, with a subsequent halfway split of 72:20. The race is still being led by the three Ethiopians, and should develop into an intriguing battle over the final 15km. A major development in the women’s race at 30km – the consistent pace of high 16 per 5km has shed Bekele and Getaneh, and now Aberu Kebede is all alone at the front of the race. Her lead is 30 seconds, and she’s on course for a mid 2:23 time. We’ve seen absolutely none of the race in the last 30 minutes, so if I could tell you where the gap was created, I would. In any event, she has established what should be a decisive lead, because the others have slowed, rather than Kebede speeding up. That suggests that she’ll hold that lead to the finish.